HA note: This series is reprinted with permission from Heather Doney’s guest series on her blog, Becoming Worldly. “Mary” is a pseudonym. 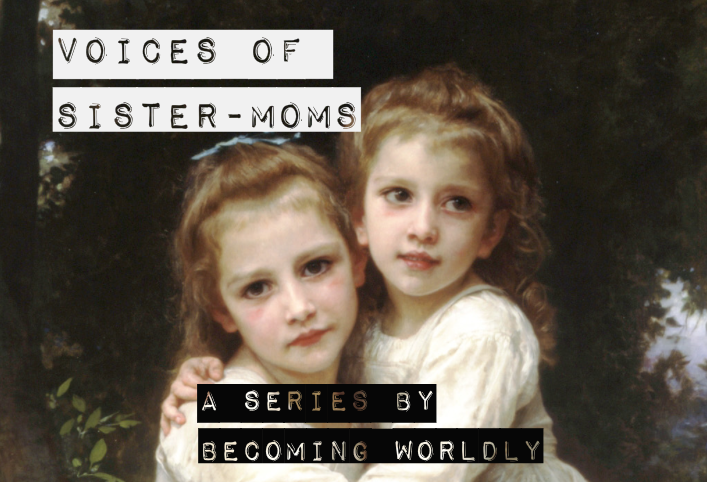 If you have a Quiverfull “sister-Mom” story you would like to share, email Heather at becomingworldly (at) gmail (dot) com. Mary has previously shared her story in full on Homeschoolers Anonymous and is the author of the “Home Is Where The Hurt Is” series. So I’ve been reading the articles this last week about the sister-moms and they have been hitting home. I am one of those sister-moms. I am the 2nd oldest of eight and the oldest girl. Most of the time I felt like the oldest because my older brother wasn’t in the picture much for various reasons. But anyway, in the Quiverfull movement, there is a world of difference being a boy in the family versus a girl. I don’t really feel like going into my story in this document, especially as it is already posted on HA. This is about another frustration that arises from my position in our family. As I was growing up, I got very used to hearing remarks and jokes about how many children we ourselves would have when we grew up. Some people would sit down and start doing the “if all 8 of you have 8 children” equations. Then they would start joking about what family reunions would look like. We didn’t go to a conservative church. In fact, for most of my younger years, we were the only home schooled family. As far as I know there was never another family as large as ours. Because of that, the jokes ran all the time. My parents relished in the attention and would laugh right along with everyone. I never let on that the jokes and even just the normal comments hurt me deeply. I never let on that I really didn’t want to have a bunch of children. One thing I always wanted to scream at people making rude comments was that I had no choice. I had no choice that my parents wanted to be crazy and follow a cult. I was just the second one to come out. I am now a mother and I have 2 amazing children. But I only have 2 and don’t plan on changing that anytime soon — if ever. The problem is that it seems I will never be able to shake all those jokes and insults from my past. For example: on my Facebook page on my birthday, there is this one guy that feels the need to always say “Happy birthday” by making some joke about how many more kids I need to “catch up” with my Mom (as if I couldn’t figure that one out on my own). When I did get pregnant with my oldest, the comments and jokes were merciless. I was working at a Christian bookstore (where I had worked for 5 years) and I knew about 80% of the customers that came in. Many others would recognize me because my family all looks alike and ask if I was a ____ (my family name), notice that I was pregnant and proceed to make a joke. I would say the incident that hurt the most was when a lady (who I thought I respected) made a comment to my younger sister about how I was such a failure to my parents and was a rebellious child that obviously never learned a thing from my parents growing up. Why did she say that? Because my sister told her that I wasn’t planning on having a bunch of children and that I wasn’t planning on home schooling. Never mind that she didn’t have a bunch of children and that she had never home schooled herself. But somehow because I wasn’t doing it, I was rebellious (at 26 years old at that time and married). I have so many more examples that I can’t forget that I wish I could. As a result of all of that, I fled that church as soon as I could. I fled my hometown, too. Right now am on the other side of the country. So I guess my point is really aimed at “normal” people. Yes, those jokes hurt. No, we (as the children) didn’t have any choice in those things our parents chose. Please be mindful of that when you speak. i am 2nd of 5, and yes, the jokes hurt. the endless comments speculating on my parents’ and their choices, their comments on finding out my mom’s ethnicity. the expectation that i was at once perfect with children, and obviously wanting lots of hcildren myself weighed on me. even to the point, that after marriage, i figured we of course would have 5 or more. even when my husband said he didn’t want that many, i thought he secretly did want that. the feeling of failure from miscarraige after miscarriage fought with the relief that we only have 2 children. the feeling of punishment for a child who had extra needs because i should have wanted more children, succeeded. I’m so sorry your father couldn’t see any value in you as a person. That’s shameful and selfish. It takes incredible strength to raise children after repeated miscarriages, and especially to raise a special needs child. You are an amazing person and your parents did not appreciate what God had given them. Stay strong. Thanks for your article, it is so important for you to speak truth to those outside the quiverful movement. I think many times people just talk and joke around with out thinking about kids being around. No kid chooses what family they grow up it. I always got a little weirded out when my brothers and I used to talk about how many kids we would have. Since there were ten of us, it was a running joke in the family that we could fill the Senate if we all had ten kids. I remember laughing, but thinking that was actually a horrible idea that went against the concept of representation for all, and also that turning two people into 100 (plus 12) in two generations had to be unethical. We didn’t hear the jokes from anyone else, because we simply didn’t associate with enough people. OMG it’s like a forever joke. My family was not large, but I still get a lot of the nonsense (although at least non-conservatives don’t say “like your mom”). One old homeschool mom recently asked what is wrong with me, and a good dozen others have made similiar remarks. Having babies is the only thing worthwhile.